War is never pleasant. But World War I was extremely bloody, with more death and destruction than ever before. Prior to World War I, battles were fought with sabers and canons and guns that shot a few bullets before reloading was necessary. During World War I, the invention of new strategies and weapons caused mass destruction. Most new techniques were unsuccessful, which also cost lives. Over 70 million men fought in World War I. About 15 million military and civilian people died. The United States lost about 100,000 people. Britain, Russia, Germany, and Austria-Hungary suffered collective losses in the millions. France lost a generation of young men. France also suffered enormous property damage as most of the war on the Western Front was fought on French soil. New Invention, Machine Guns: During World War I, a water-cooled machine gun was invented. This was used as well as air-cooled machine guns. These guns could fire hundreds of bullets in a rapid stream before reloading. The water-cooled machine gun did not need time to cool down and could be used continuously. The use of both guns allowed attacks and casualties to be bigger and more devastating than ever before. The machine gun is still an important weapon in use by the military today. New Invention, Fighter Planes: Planes were still primitive and limited during World War I, but the military recognized their potential. Armed with machine guns, fighter planes could cause a great deal of damage. They could also raise spirits of the fighting men on the ground. Men in the trenches could look up and see their fighter planes overhead. 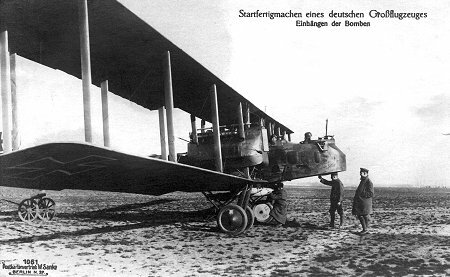 World War I pilots became known as "Knights of the Sky". Their goal was not to shoot enemy pilots but rather to shoot down enemy planes. If the pilot died as a result, that was war. But should an enemy pilot live through a crash, and be able to be seen alive on the ground, it was custom to fly over a nearby enemy encampment and drop a note letting them know that one of their pilots had lived through a crash. Some very famous pilots fought in WWI, pilots like the German pilot, the Red Baron. 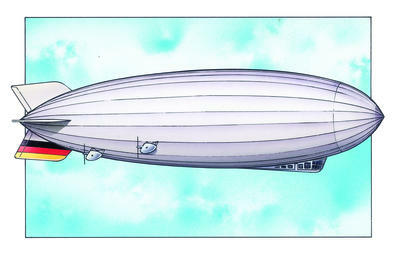 New Invention, Zeppelins: Zeppelins were huge manned balloons, filled hydrogen to make them fly. They were used by the German army to make bombing raids on England. New Invention: Tanks: Tanks were primitive during WWI. Many broke down, but some made it through enemy lines, causing great destruction of manpower and property. 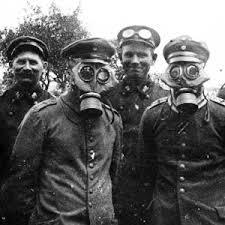 New Invention, Poison Gas: A poison gas, a type of mustard gas, was invented in World War I. To fight this, the gas helmet was invented. New Invention, Barbed Wire: Barbed wire was used to help stop men attacking and getting into the trenches. When the military realized that barbed wire laid across the ground in front of a trench entangled the enemy, they began producing barbed wire with barbs longer and sharper. U-Boats: Submarines had first been invented in the late 1800s. They were still in their infancy in 1915 when the Germans began using submarines, called U-Boats, to sink ships from freighters to passenger liners. One of the most famous sinking was a U-Boat attack on the unarmed passenger ship, the Lusitania. New Form of Fighting, Trench Warfare: A new form of fighting in World War I was the use of trench warfare. Both sides dug trenches, which were deep ditches. Between 1914 and 1918, both sides built trenches. By 1918, trenches on both sides stretched for about 12,000 miles. There was a row of three trenches on both sides. There was the main trench, the reserve trench, and the rest trench. Inside the trenches men were somewhat protected from enemy fire. Men spent about 8 days in the main trench, then about 4 days in the reserve trench, and then about 4 days in the rest trench or even a rest camp if one had been established. This was true on both sides. Conditions in the trenches were horrible. Trenches offered protection, but they were also filthy and a breeding ground for disease. The Spanish Flu began in the trenches. This disease spread around the world after World War I, when troops were demobilized and sent home. About 50 million people died between 1918 and 1920 from the Spanish Flu. No Man's Land. Technique: The Creeping Barrage: One technique commonly used was the creeping barrage. Men would crawl out of the trenches, creep outward for a bit, then open fire. Many millions of men died as a result of this unsuccessful military strategy. The open land between enemy trenches soon became known as No Man's Land, because no man could survive it. The military was not used to trench warfare. They were used to fighting face to face on open ground with sabers and rifles. Machine guns were new as well. It was a suicide mission to send men to crawl out of the trenches and face the other side on open ground, while the other side was tucked safely in a trench, armed with machine guns and canons. Yet, this technique, the creeping barrage, was used over and over during World War I. Technique: The Artillery Barrage: Another technique used was the artillery barrage. The army used short bursts to kill as many of the enemy as possible in a short time. There was a rest period. And then the barrage began again. This was a tactic used to both kill and depress the enemy. What was a Zeppelin and how was it used?